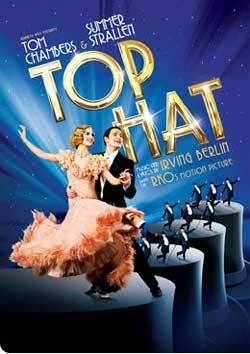 Roger and I went to the theatre last night to see Top Hat - and we came out humming every note. And wanting to tap dance. Seventy-seven years after Fred Astaire and Ginger Rogers lit up Hollywood’s silver screen with one of the greatest dance musicals of all time, RKO Pictures’ Top Hat is now playing at the Aldwych Theatre in London's West End. Starring Tom Chambers and Summer Strallen, and packed full of Irving Berlin’s greatest hits such as Let’s Face the Music and Dance, Cheek to Cheek and Top Hat, White Tie and Tails, Top Hat is a giddy, glorious celebration of 1930s song and dance. With lots of tap dancing! Loved it.